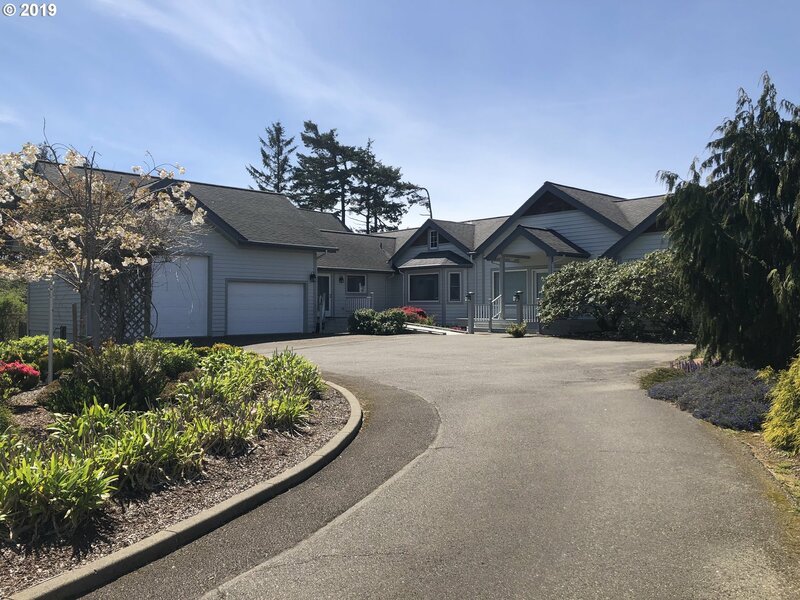 All Coos Bay homes currently listed for sale in Coos Bay as of 04/25/2019 are shown below. You can change the search criteria at any time by pressing the 'Change Search' button below. 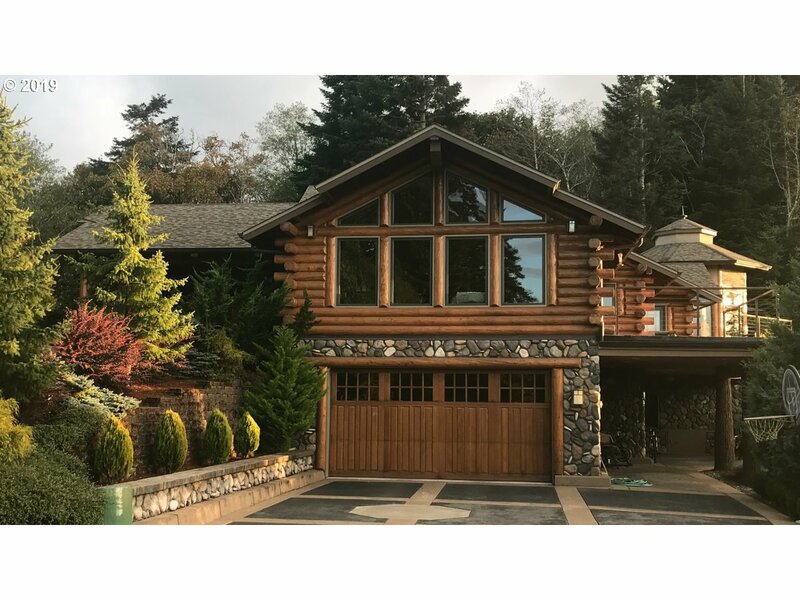 If you have any questions or you would like more information about any Coos Bay homes for sale or other Coos Bay real estate, please contact us and one of our knowledgeable Coos Bay REALTORS® would be pleased to assist you. "METICULOUS CUSTOM built 4,221SQFT home 3bd,3 1/2bth W/AMAZING RIVER VALLEY VIEWS from almost every room. PRIVATE & SECLUDED w/XTRA LG concrete deck & custom handrail. Plenty of room for entertaining. Home offers 8ft AFRICAN MOHOGANY doors, Large open floor plan w/gourmet kitchen, granite counter tops & solid cherry cabinets. High 10.6FT ceilings w/CUSTOM Myrtlewood flooring. 16X20 Shop w/400amp service w/2 1/2 car garage approx. 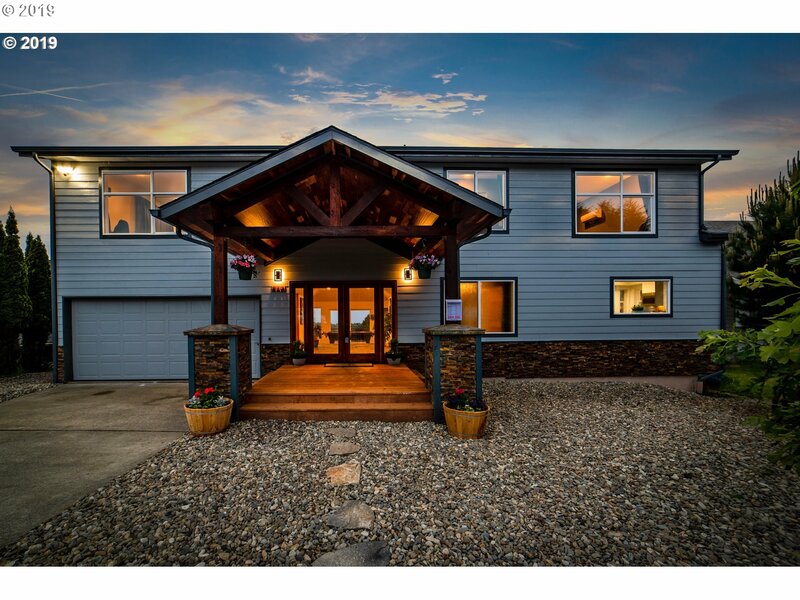 1,000sq"
"One-of-a-kind custom built log home w/incredible attention to detail throughout. Perched on top of the mountain with spectacular views of the water & valley 10.4 acres w/water frontage. End of road privacy w/gated entry w/call box. Great room, office/den & lower level family room, 5 gas fireplaces, wine vault, outdoor kitchen, hot tub and much more. No drive bys, no place to turn around." 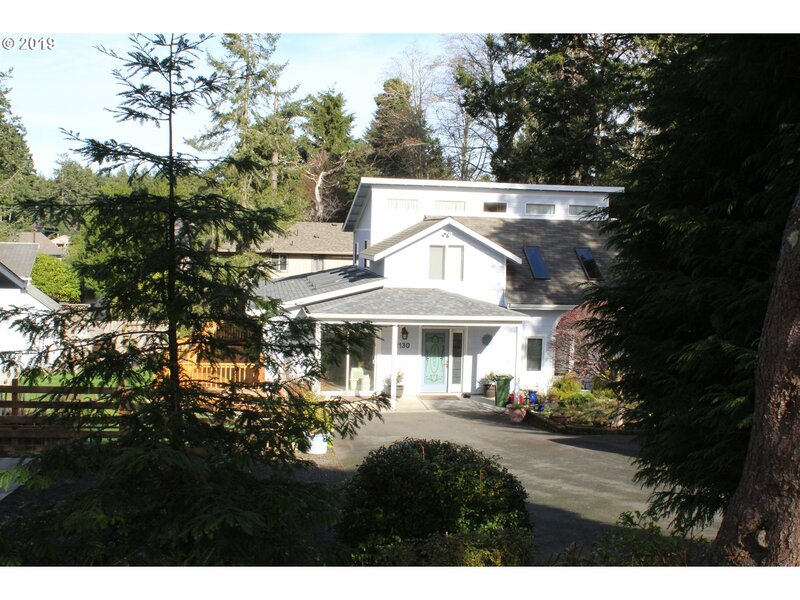 "Situated on nearly 1/4 acre in the premier Coos Bay neighborhood of Telegraph Hill. Beautiful panoramic views from this contemporary custom designed 2-story home. Convenient access to all urban amenities. Features include: Bright spacious new kitchen, bamboo flooring, wool carpeting, propane fireplace, 3.5 Baths and solarium. Lower level includes 2 Bedrooms, Full Bath, a kitchen with great room and separate entry, drive way and carport." "Are you looking to make a new start? Then this is the place for you. 5.8 ac river front hobby farm with furnished 3 Bd 2.5 bth home and shop. Includes everything. EVERYTHING. Kubota tractor & attachments, lawn equipment, sports equipment, over cab camper, boat, tools, fishing poles, log outdoor furniture, etc. Home has back-up generator, automatic irrigation, fish cleaning station & plenty of space for outdoor or indoor entertaining." "Stunning custom home with detached commercial building overlooking the river. Quality construction with the finest materials and craftsmanship throughout. From the moment you walk in, your eye is drawn to the gorgeous finishing touches. Open floor plan with vaulted ceilings, gourmet kitchen w/ 6 burners gas stove, remote-control skylights, surround sound inside/out, and incredible master suite. Large shop and RV carport." 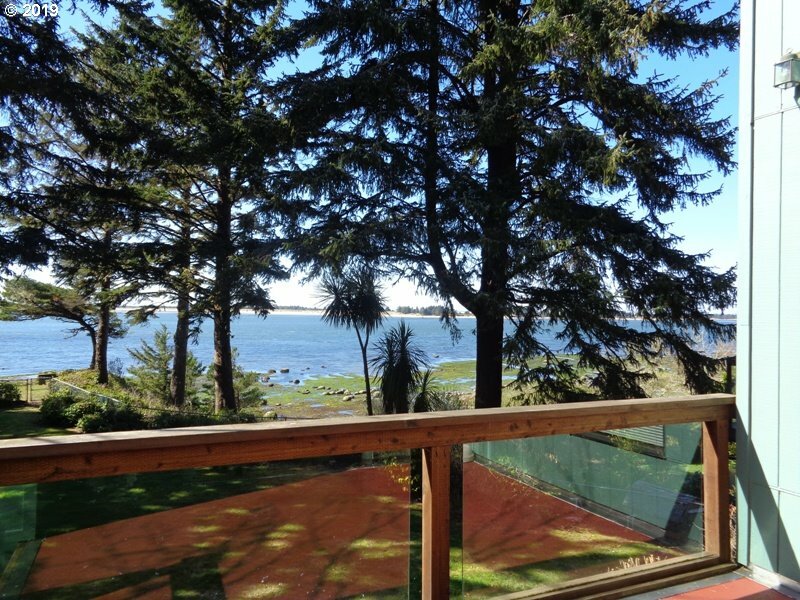 "Stunning views of Coos River & Pacific Ocean! This spacious 3b/2b bay front home offers 2300sqft, living room w/custom stain glass divider from foyer, SS appliances in kitchen, central vac, over sized garage, laundry room. Mature landscaping w/circle drive, green house & shed. Enjoy water views from custom kitchen, living room, master bedroom, 2nd bedroom & landscaped backyard w/deck. Enjoy boat watching, sunsets & more, A Must See!" "Forever Unobstructed Bay Views & Amazing Sunsets in this Brand New Custom Home w/a Very Private Setting!! 3bdrm 3bath Single Level, Open Floorplan, Dbl Mstr Suites, Gourmet Kitchen w/5 Burner Verona Natural Gas Range, Bertazzoni Refer & Dishwasher, Huge Cooking Island/Eating Bar, Beautiful Quartz Countertops. Mstr Bath w/Heated Tile Floors, Woodbridge Slipper Tub & Roll-in Custom Tile Shower. 550sf Covered Deck & MORE!! 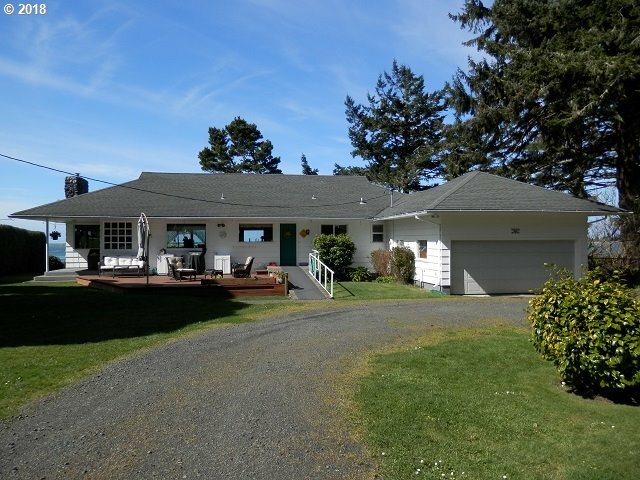 WATCH VIDEO TOUR"
"Enjoy stellar sunsets and stunning ocean views all the way to Cape Arago Lighthouse! This tasteful home has been extensively remodeled and has tons of space with over 3,900 SqFt. 5 BD & 4 BA with a Den plus Media room w/3D projector & 150 screen. Grand slate entry leads into the open living space perfect for entertaining and family time. Level fenced backyard, deck & like-new hot tub. Low maintenance & located in desired neighborhood." "Wonderful water front property! View of the ocean, jetty, and Charleston Harbor. This 1 family custom built home is super clean and move-in ready. Inspections have been completed and all work has been completed. Watch ALL the ships come in Coos Bay from your home. Direct bay beach access. Wonderful Water view from almost every room in the house! Home features 3 large bedrooms and 2 1/2 bathrooms. Sold as-is." 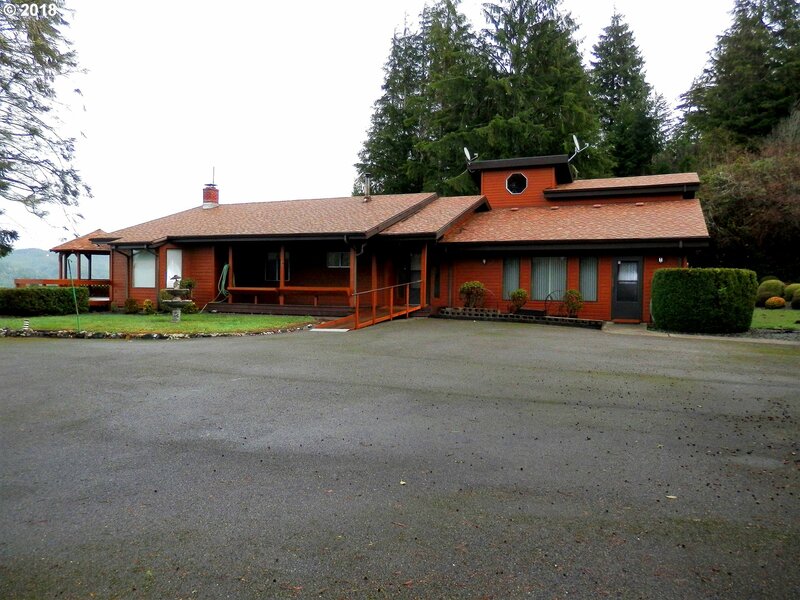 "Exceptional Family home in Coos Bay's highly sought after Telegraph Hill. Something for everyone, in this Spacious 4 Bed/3 1/2 Bath Spotless home. Living Rm, Family Rm, and a huge Bonus Room! Master Suite on the main level. Bay Views, Attached Garage AND Detached Shop/Garage in back. Great Yard, Patio, Decking, sports court area, and more! One Owner home, very well cared for. Beautiful landscape, water feature, warm and welcoming place!" "Fabulous Horse Property! Over 20 acres, Sub-irrigated grazing pasture. Built-up dykes allows for driving pasture perimeter. 2,000+ sq ft custom Lodge-Pole Pine log cabin and Hardi exterior. Custom Maple cabs, Tamarack/Hemlock ceilings, Cedar & pine trim. Bosch D/W. 24X36 shop, 2 RV hookups, 2 tax lots. 5 apple trees, cherry, plum; coy pond. Covered porches. 30yr Arch. roof, aluminum gutters; Kennel. Circular Drive encloses home/yard." "Chalet style home with vaulted ceiling. Privacy and Seclusion on your very own peninsula. 180 degree bay views of South slough and Charleston harbor. Private decking. private road. Coy pond. Garden, greenhouse. Horse barn. Agent must accompany all showings. No drivebys allowed. I/3 mile Bayfront. watch the ORCAs pass by. Fish off the peninsula." "BAY FRONT DELIGHT! Panoramic views of the sparkling bay, dunes and maritime activity from this single level ranch style gem. 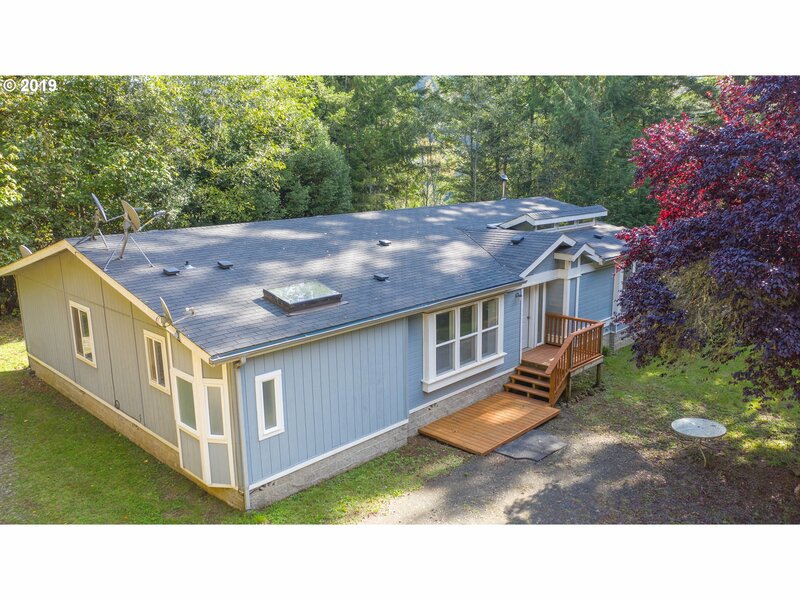 Warm pellet stove insert, 3 bedrooms,2 baths dual decks, hot tub, pantry, lots of storage, Immaculate landscaping with underground sprinklers, boat garage. Simply Sensational!" "Custom 3 bd/2 bth home with a Bonus room over garage that has a kitchen and bath. Home has granite counters, bamboo floor in kitchen, 2 living areas, 656 sq ft. Master suite upstairs with luxurious bath, vaulted ceiling with skylights and remote blinds, green house, large yrd with fruit trees and hot tub. Both are active vacation rentals. Live in one, have income on the other!" "WHO COULD ASK FOR ANYTHING MORE? Close to town privacy on .77 acre, spacious comfortable 3 bdrm, 2 bath Home, large Double garage. Huge shop includes RV Parking, outstanding bay/river vistas, Gazebo Deck, extensive paved parking. Don't Delay!" "This is what we're looking for, country acerage close to town yet private, seperate fenced area for those critters/kids, shop for the projects, fruit trees and lots of sun for gardening in Coos County where gardens GROW!, large covered deck looking at the horse shoe pits and volleyball net, plus...."
"Completely renovated home. Wood and travertine floors, huge kitchen with granite countertops, stainless steel appliances including gas range, new refrigerator and dishwasher. Expansive custom cabinets and cook's island. 2 bedrooms, office, laundry and bath on main level. Master suite upstairs with large granite topped vanity, jetted tub, custom tiled walk-in shower, walk-in closet and a covered balcony. Detached garage w/10'doors for RV"
"Beautiful home in a very quiet, wooded area. Owners have added 775 Sqft which includes a sunroom/family room, a master bedroom & bathroom, a laundry room, as well as a huge deck outside.They have also added a 2 car garage/shop complete with office & full bathroom. The backyard has an additional building currently being used as a she-shed. Also RV Parking." "ELEGANT. Lovely Home. Formal living room, formal dining. Remodeled kitchen with marble counters, stainless steel appliances. Garage and carport. Great neighborhood, convenient to all of town. 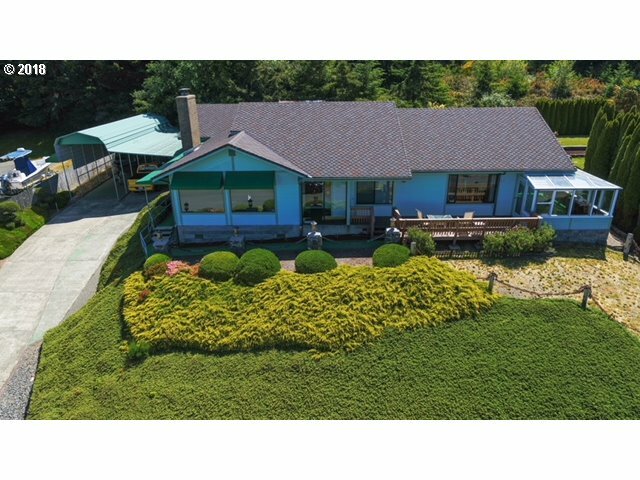 Gorgeously landscaped backyard, which borders the Coos Bay-North Bend water board property, giving you the utmost privacy and serenity. Currently leased." "Secluded single level remodeled home. 6.44 acres with wooded hillside. Valley view. Open floor plan. Separate Utility. Walk-in pantry. RV garage. This home offers privacy and seclusion yet minutes to town. Remodeled kitchen with sliders to deck. Enjoy the deer, gray squirrels, humming birds and outdoors." "2.78 acres to provide County Feel in town! County accessed over $450,000. Cozy 1 level, 3 bedroom, 2 bath home with family room and laundry room. Large 24X36ft.shop with 10ft.doors. Tree house with Bunks for the kids. Decks, flowers, nature and privacy. Minutes from Charleston and Beach's. Public water and Sewer! Make an appointment now!" "Beautiful Park Like Setting that is Fully Fenced & Tree Lined! Quality home with Professional 50x60 commercial grade Shop on over half acre level lot. Includes: shop office or apartment with full bath, fish/crab cleaning station, 3 RV hook-ups & clean outs, garden, drip system & UG sprinklers. Shop includes 3 phase power, air outlets, Fully heated with oil furnace & 2 LG Roll-up shop doors. Potential Air B&B to Earn extra income." "Magnificent home with beautiful ocean and bay views! Gourmet kitchen with beautiful copper valances and luxury stainless steel appliances. Sun room off of master suite to enjoy the amazing views. Upstairs has bedroom and bonus room with wet bar. Downstairs was converted to family room. Lots of room to grow in this home. Extra deep attached over-sized carport to keep your RV, boat and vehicles in. Sauna, storage shed, fountain and more!" "Great property with lots to offer. 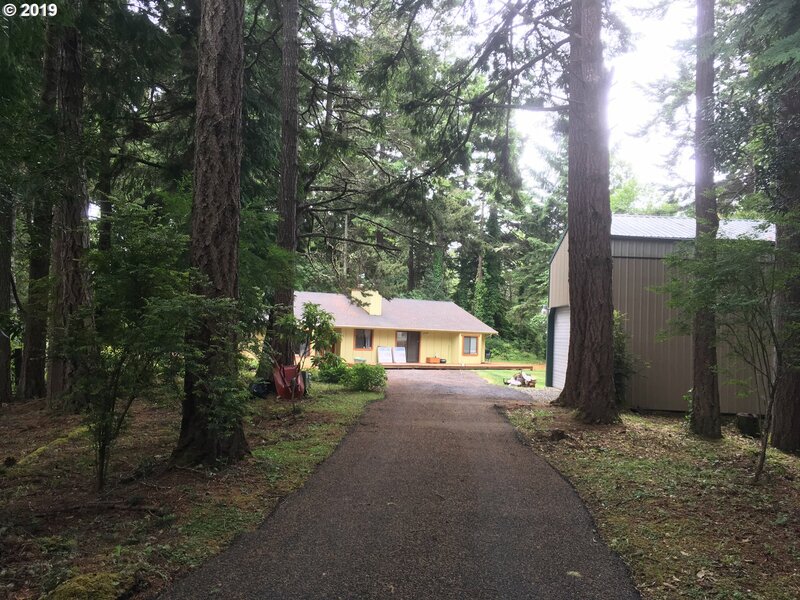 2 homes, pasture & trees, lower manufacture home is a 1974 (1440 sq ft) 3 bed, 2 bath, wood stove and storage shed, upper manufactured home is a triple-wide 1993 (2362 sq ft) home, 3 bed, 2 bath, very open feel, family room and living room, formal dining area, great kitchen lots of cabinets and so much more, pasture needs mowed but has lots of potential for animals, some timber, call for more details."